PS-01 Large Cylindrical Sensor Does not require power for operation Omni-polar device; actuates with either pole of magnet Normally open (NO) contact, others available on request Three magnetic sensitivity bands Contact rating of up to 60W available Special versions withstand 1m drop test without change in sensitivity These cylindrical sensors are suitable for switching up to 70W line voltage. Various activating distances are available depending on the magnet and the AT band used. This sensor can be supplied with non-standard connectors on request. All sensors are tested 100% for operate and release AT, contact resistance and variable contact resistance before packing. Our products are completely Lead-free and conform to the RoHS directive. PS-03 Flat Pack Proximity Sensor Does not require power for operation Omni-polar device; actuates with either pole of magnet Normally open (NO) contact, others available on request Three magnetic sensitivity bands Various types of leads and connectors available Actuator magnet available in same housing This screw mountable sensor can be mounted with M3 screws and can switch moderate loads of 10W. It is particularly useful in industrial applications where distance adjustments need to be made every now and then. Various activating distances are available depending on the magnet and the AT band used. This sensor can be supplied with non-standard connectors on request. All sensors are tested 100% for operate and release AT, contact resistance and variable contact resistance before packing. Our products are completely Lead-free and conform to the RoHS directive. PS-05 Flat Pack Proximity Sensor with Actuator Does not require power for operation Omni-polar device; actuates with either pole of magnet Normally open (NO) contact, others available on request Three magnetic sensitivity bands Various types of leads and connectors available Contact rating of up to 60W Actuator magnet available in same housing This screw mountable sensor can be mounted with M3 screws and can switch loads of up to 30W. It is particularly useful in industrial applications where distance adjustments need to be made every now and then. Various activating distances are available depending on the magnet and the AT band used. 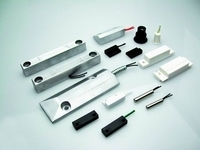 This sensor can be supplied with non-standard connectors on request. All sensors are tested 100% for operate and release AT, contact resistance and variable contact resistance before packing. Our products are completely Lead-free and conform to the RoHS directive.